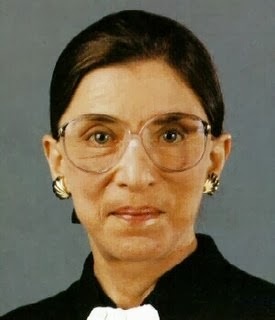 So it begins - the not so subtle liberal attempt to squeeze out Ruth Bader Ginsberg from the Supreme Court before president Obama is gone and the risk of the next president being a Republican means a more likely conservative replacement Supreme Court Justice. The not so subtle subtext of a Washington Post piece reads as a hint to Ginsberg to 'hit the bricks'. There are tours of the countryside and hikes in the hills. There is VIP access to the works of Georgia O’Keeffe. There are sumptuous dinners prepared by her daughter, Jane, that last until 2:30 in the morning. But it not so subtly gives way to the title of the article - stay or go? - with a clear hint that GO is the way to go. “We need her to stay forever,” says one woman after Ginsburg walked past. The article pays lip service to the notion that it's because of her advancing age before laying out the real reason liberals want her gone (and it's not because she's fallen asleep during cases). There are no set rules for when a justice leaves her lifetime appointment, although for Ginsburg there is no shortage of advice. The first justice nominated by a Democratic president in 26 years when President Bill Clinton chose her, she has been nudged to leave ever since the election of another Democratic president who could choose her replacement. The court has four consistent liberals, including Ginsburg, and four consistent conservatives, and the justice in the middle, Anthony M. Kennedy, is a Ronald Reagan-nominee who more often than not sides with conservatives. If the court’s membership does not change before the 2016 election, the new president would see a Supreme Court with four of its nine members older than 77, including half of the liberal bloc. “The reality of the court, and the parties, these days is that Ginsburg ... should know that a justice selected by President Rubio or President Jindal or President Cruz is going to produce a very different nation than one selected by Barack Obama,” wrote political scientist Jonathan Bernstein in The Washington Post. He was not the first. We should be happy the Clinton appointee is a target of liberals these days. But for conservatives, or any one who prefers an non-interventionist Supreme Court, right now is probably the worst time for her to go. If there's a chance for her to outlast Obama, we should encourage her to stay on. Failing that, I say we Bork whoever Obama nominates. And not in a limp-wristed way the GOP did with Sotomayor or Kagan.